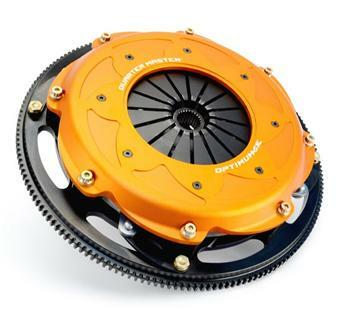 Those looking for a true racing clutch with factory driving characteristics will find Quarter Master® Optimum-SR™ Clutch Kits ideal. The kit’s lighter weight creates a reduced MOI (Moment of Inertia), allowing the engine to rev and de-rev quicker than a stock OE unit. All these features knock seconds off the stopwatch, while delivering a stock pedal feel and chatter-free operation. Holding up to 1400 ft./lbs. of torque and 1000 horsepower (in twin configuration), kits include clutch, flywheel, release bearing and alignment tool. Additionally, the unit is constructed with proprietary spring technology and is compatible with OE-type hydraulic bearings or the Quarter Master® Tri-Lite II Hydraulic Systems.